There is always a minimum three day interval in a women’s life every month, where she undergoes a biological scenario after attaining puberty. At this time profuse of unwanted blood gets excreted from her body in these days. In some cases, the bleeding would be unusual and may have overflowing of blood every now and then continuing even for many hours during the menstrual period. This scenario of overflow of blood is called the menorrhagia. In this health article, we will clearly have a look at what are the causes and remedies for heavy menstrual bleeding (Heavy periods). Before having a look at the scenario and causes with remedies for this problem, let us first clearly understand what exactly is the menstrual period. In addition, we will also clearly see what are the main causes for heavy bleeding in women and the remedies for heavy bleeding problems. This is a normal occurring process in all the women who has attained puberty. Every month , the eggs in the ovary regimes itself to form new egg cells where the old ones are excreted from the women’s body in the form of blood. This is called Menstrual periods in women and it usually occurs within 21 to 35 days regularly. There may be some females who may not have a regular menstrual cycle and suffer from irregular periods whereas on group of females suffer from too much flow of blood during the menstrual cycle. The menstrual periods usually ranges from 1 to 5 days depending on the immune system and the health habits of a women. At the time of periods, there will a normal level of excretion of blood in most women and will have some pain and cramps in the bowel region and the tummy region of women. There are some exceptional cases where the flow of blood is precedingly in excess than the normal level of flow of blood causing much impacts on a women. When there is heavy bleeding being witnessed, it automatically reduces the metabolic activity in the body and in turn the body loses all its energy and makes you feeble and anemic. 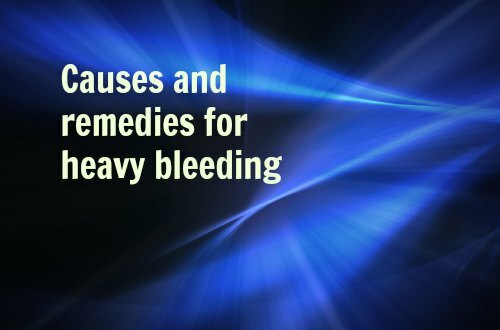 Let us now have a look at the causes for heavy bleeding during the menstrual periods. The first and the foremost reason mainly stated for this problem by experts is the imbalance of hormones. Hormones are responsible in regulating a proper and normal periods. The main hormones responsible for the process are oestrogen and progesterone. This problem usually occurs for people who are either at the start or ending phase of menstrual cycle in their life. The uterus which is responsible for the occurrence of the menstrual cycle, when affected with some infections or diseases can cause heavy bleeding problems in women. The infection may be sometimes small or at times the infection may be the presence of some cancer cells in the uterus causing heavy bleeding issues. The infection is more significantly occurring in women at the time of post-pregnancy. Women who are in their pregnancy, may have some issues resulting in the miscarriage of pregnancy. In such cases, the fertilized egg gets itself implanted outside the uterus and exactly in the Fallopian tube. There are some people who are exposed to heavy bleeding problems just by the use of blood thinners in their body. Read: How to stop Pregnancy ? When problems occurs in the glands that are attached to the uterus walls, heavy bleeding occurs usually in women. The problem is mostly associated with females who have given birth to more number of kids. This syndrome is called as the Adenomyosis. Infection of the uterus by some pelvic inflammatory disease are also one of the major causes for heavy bleeding. Various types of cancer can also be the causes for heavy pro-fused bleeding of blood in women. Other causes may include the abnormal function of various organs in the human immune system. There are also chances for heavy bleeding which may be caused by improper functioning of contraceptives for birth control. Consulting a medical expert to check for problems in uterus can be of the first and foremost option to get rid of the problem. They may allow you to undergo a series of procedures, where a thin scope is inserted into the vaginal and cervix region to remove the masses if any, present in the uterus. They also will have a clear idea of your uterus lining and can easily find the cause and suggest some better remedies for the problem. In some cases, it may be noticed that the uterus is partially or fully affected where comes a scenario of it to be removed. In such cases, two methods are followed by physicians. The first method is to just remove the lining of the uterus walls and the other one is completely removing the uterus. In both cases, after the procedure is completed, the bleeding gets controlled but it is impossible to have a baby. For time-being and temporary relief there are many pills which are available in pharmacies to reduce heavy blood flow and the pain caused by them. Some of the most familiar pills are Ibuprofen and Naproxen. It is suggested by medical experts for people who are affected at a minimal level to undergo various therapies to maintain the hormonal balance in the body. This in turn will help to limit the bleeding and pain. There are also medications to promote blood clotting without disturbing the hormonal balance in the body. Dilation can also be done to stop heavy bleeding. In this process, the cervix and the lining surrounding the uterus is completely dilated by the use of various chemicals. This may look costly but it has great benefits and are affordable to the middle class people.